It’s been a week since we arrived in Australia for our two week study tour. None of our group members have been to Australia before, except for Angie but she doesn’t remember much! We are having a lot of fun at school. On the first day, we were very shy. We didn’t even try to talk to the local students. Since the local students here are very kind and nice, we started to talk to them. Making friends in a foreign country is much better than we thought. We even added them on Instagram and Facebook. It’s good that we can know different people from around the world. We are so happy to be in Australia. We are learning to be more self-disciplined and to manage our time well. Living without our parents needs a lot of courage. People might think that staying without our parents will give us a lot of freedom but we miss our parents. We miss their love and care, and the food! It’s hard for us to adapt to the eating habits in Australia. For example, we have our dinner at 6pm here! Other than learning inside the school, we also learn outdoors. We visited many towns on the coast where we saw a blowhole, lighthouse, waterfall, rivers and beautiful beaches. We also visited the capital city Canberra and had a tour of the Parliament House, enjoyed the view of Canberra from a lookout point and had a great time at the zoo where we saw many native Australian animals. Some of us girls were thrilled to be able to play with and pet a wallaby (a small kangaroo). The most unforgettable memory in this trip was our visit to the Crookwell Wind Farm (176 windmills) near Lake George, which is dry most of the year. It was so cold because of the wind chill factor. No wonder they built the windmills there as the winds were very strong. All in all, we are having fun here while we learn. After ten years, when we look at the hundreds of photographs that we have taken on this trip, it will bring back very sweet memories of a wonderful study trip. 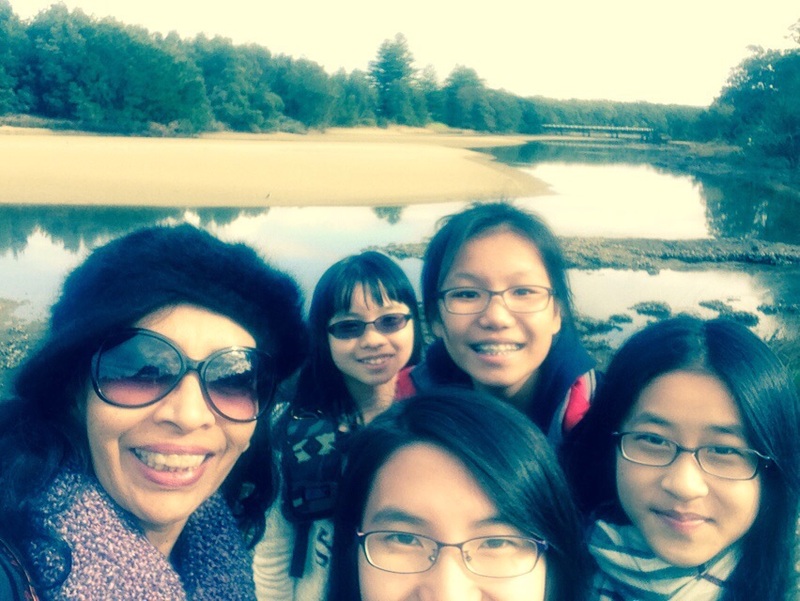 Last Saturday, we went to Canberra the capital city of Australia. Although it’s not as famous as Sydney or Melbourne, there are many amazing places to visit. First, we went to Marion Mahony Griffin View Point located up on a mountain. The temperature was freezing cold but the views were absolutely wonderful. 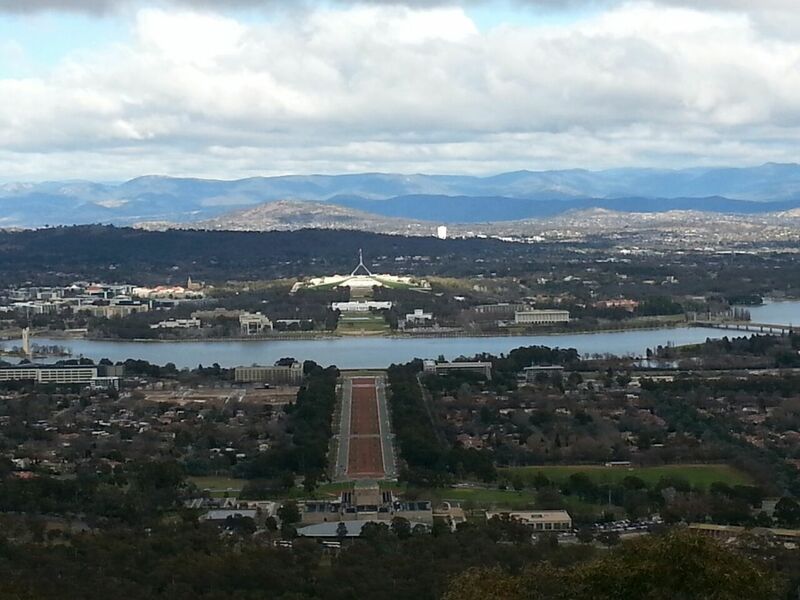 We could see the entire city of Canberra and the iconic Parliament House, Parliament Avenue and War Memorial. After that, we went to the Parliament House, the seat of the executive and political power in Australia. There is strict security to monitor the visitors entering and exiting the building. Inside the building, there are many artworks presented to Australia by other countries. From the roof of the parliament building we could see amazing views of Canberra and also the Chinese Embassy. Lastly, we went to the national zoo in Canberra which is really very good as we could see a lot of animals such as lions, tigers, cheetahs, bears and Australian animals like kangaroos, wombats, koalas, etc. Some of the animals are endangered animals. This is important as they can be protected from becoming extinct. The zoo is really beautiful as it is located on a hill where we can see animals and beautiful plants. We really enjoyed visiting the zoo. Canberra is a beautiful city. Although it is similar to a town and not a big city, the history of Canberra is interesting so we enjoyed the trip a lot. On the fourth day of our visit to Australia, we had our first outing – a day trip to Woolongong along the coast stopping in many historic spots. On our first stop at Kangaroo Valley, we saw a historic bridge of classical design. We walked down to the river which we thought was dirty but was actually very clean and beautiful. Our second stop was the lookout point at Cambewarra from where we could see the panoramic view of the Woolongong and Nowra districts. The views were stunning. We also witnessed the beautiful rosella birds with their babies eating happily at the feeding stations. This made us think of our moms in Hong Kong. The third stop was the Seven Miles Beach. The beaches in Australia are so much cleaner than the beaches in Hong Kong. This shows the patriotism of the citizens of Australia and the fact that they are more aware of protecting the environment. We had a mission of taking a group photo, which we did with all of us jumping up in the air! Fonda also recorded a slow motion of throwing seashells into the sea. We had a great time at the beach. After the beach we enjoyed our packed lunch in Gerroa. The meal tasted very good, and we would like to thank all the teachers who helped to prepare such a delicious meal. 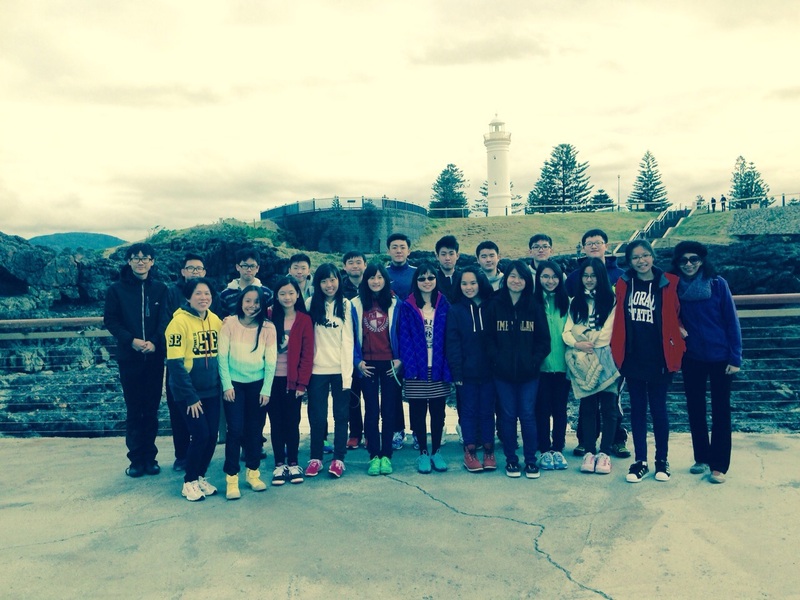 After lunch we headed to Kiama which has a lighthouse of great historical value. Next to the lighthouse is a blow hole. It is located on the Pacific Ocean. When the waves crash on the shore, the water spurts through the blowhole which is an amazing sight. Many of us waited near the fence to capture the moment when the water sprays through the blowhole. Surprisingly, some of our classmates and the teachers sighted whales – a southern right whale and her cub – playing near the shore. Sadly we were not the lucky ones. Since it was very windy near the seashore, we ran back to the bus as fast as we could. Lastly, we would like to thank everyone who organized this tour and guided us. We had a wonderful day.